Habitat: Walnut is native to Europe and Asia. 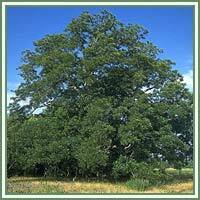 Description: Walnut is a large deciduous tree, reaching a height of 35 meters. It usually has short trunk, with brown to gray bark, smooth and fissured. Crown is rich and broad. Leaves are green and alternate, ovate to lanceolate in shape. Male flowers are drooping catkins, and female flowers are grouped in clusters, forming a fruit with a deeply ridged green husk, brown shell and fleshy, edible interior. 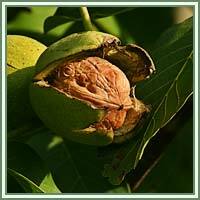 Medicinal use: Walnut is considered to be an astringent, antifungicide and antiseptic. Due to its tannin content, a decoction of Walnut leaves can be used in treatment of diarrhea. Walnut oil is used in treatment of tapeworms. A decoction made from the fruit can stimulate the production of thyroid hormones. Usage of nut decoction on a daily bases can thus be beneficial in case of hypothyroidism. Used externally, Walnut can help in treatment of various skin conditions, such as acne, eczema, dermatitis, herpes, itching and psoriasis. Walnut can also be very beneficial as a hair care ingredient. It is said that a decoction made from dried leaves could help in prevention of hair loss.